St. Kieran’s Kilkenny defeated Ardscoil Ris by 1-15 to 1-13 in the All-Ireland Post Primary Schools Croke Cup (Senior Hurling “A”) Final on Monday March 28th at Semple Stadium Thurles. FORMER Limerick star Niall Moran leads his Árdscoil Ris side into the final of the Masita GAA All Ireland Croke Cup final on Easter Monday, happy that the culture of hurling is alive and well in his school. Árdscoil lies in the heartland of Limerick City, a hotbed for rugby and home to a growing soccer population too, but Moran is happy that the school’s presence at post-primary hurling’s top table will enable the small ball game to continue to thrive in the county. “I would say that over the years there are eight or nine teachers who have played a role in the school getting to where it is at the moment and it means a lot to everyone that we are contesting All-Ireland finals,” Moran says. “It also means a lot to our feeder clubs around Limerick and Clare and to our players who are well tuned and motivated. But we have good players and it’s easy to motivate them. School teams go in cycles but it is important to maintain what we have. The truth is that we have scant sporting facilities in Árdscoil but we fight harder because of that as we cannot lose our culture of hurling. With All-Ireland winners like Darach Honan passing through the senior team in 2005/06 and Shane Downing and Dec Hannon excelling there also after that, the school has maintained its ability to feed the nearby intercounty teams. Alongside Fergal Lyons, Paul Flanagan and Barry Hennessy, Moran has been at the helm of the Árdscoil team for the past few seasons. They have excelled in Munster, but have experienced continued heartbreak in the All-Ireland series. Most recently they were beaten in last year’s All-Ireland semi-final. But they have powered their way back into this year’s final again after a thrilling 1-18 to 0-20 semi-final win over Presentation College Athenry. That resilience can only be admired after losing the Croke Cup finals of 2010 and 2011 at the hands of St Kierans College, who again stand in their way. This time, however, the stakes are even higher as the Kilkenny side are seeking three All Ireland titles in a row. Moran feels that success merely paints hard work in a better light and that no matter what happens on Easter Monday that graft will not stop in Árdscoil. Giants of the colleges’ game St Kieran’s would do well, however, to note the insatiable hunger of the Limerick school who are desperate to get over that final hurdle. “We do indeed know how hungry they are,” says Kieran’s manager Liam Smith. “We played them in a challenge over Christmas and they beat us well. We know the heartbreak they have endured in recent years and we realise that we will be up against it. Each summer, Smith and his mentors scour the local underage championships to watch players who might not yet have made ‘A’ teams in Kieran’s. On Monday, they field one player who never played in ‘A’ competition until this season and another who was on a school ‘D’ team when he first began his juvenile career with the college. Whatever the formula, it works. Last year the Croke Cup specialists collected a 20th title at Semple Stadium and only cemented their status as standard bearers in post-primary schools ‘A’ hurling with a three-point victory over Thurles CBS. This entry was posted on Monday, March 28th, 2016 at 1:00 am and is filed under events, News. You can follow any responses to this entry through the RSS 2.0 feed. Both comments and pings are currently closed. Abbey CBS defeated St. Louis Ballymena by 2-19 to 2-13 after extra time in the Masita All Ireland Post Primary Schools Senior Hurling “B” (Paddy Buggy Cup) Final on Monday March 28th at Semple Stadium Thurles. Abbey CBS (Tipperary) 2-19 St Louis Grammer School, Ballymena (Antrim) 2-13 (AET): On such a momentous day for Abbey CBS, it was fitting that Shane Power would have the final say as the Tipperary Town-based school claimed a first Masita GAA All-Ireland Post Primary Schools Paddy Buggy Cup senior B hurling title since 2002. Beaten All-Ireland B football finalists last year, Abbey ensured they wouldn’t be bridesmaids in the small ball code with a hard-fought extra-time victory over St Louis Grammar School from Antrim. Power unleashed a torrent of emotion when he lashed home the insurance goal in the dying embers of extra-time and the Galtee Rovers player lined out just a day after his sister’s funeral. Team mentor Darragh O’Donovan, a member of Limerick’s senior hurling panel and an All-Ireland U21 medallist last year, hailed Power’s strength of character at full-time. O’Donovan said: “Shane is just an amazing fella. There’s not a player in Tipperary can catch a ball like Shane can. “He’s beaten every centre back he’s played this year. “To come out and do what he did today, I don’t think anyone else could have done it. Two late frees from leading scorer Rian Doody brought the game into extra-time before Abbey kicked for home. St Louis scored the only goal of regulation time in the 19th minute, Ronan Graham kicking home the first of his brace from close range. The remaining three goals of the game arrived in a three-minute spell at the end of extra-time, Daire Egan netting to establish a six-point lead for Abbey before Graham struck again. The final word went to Power, who capped a fine individual display in difficult circumstances with an emphatic finish into the top corner. O’Donovan insisted: “The boys were never going to get tired. We came in eight days over the Christmas, this week we were in four times. We’ve trained at 6, 7 o’clock in the morning, we’ve often done two hours after school.” All of that hard work paid off as the Abbey claimed a third B hurling crown, following on from previous successes in 1992 and 2002. Scorers for Abbey CBS: R Doody 0-10 (7f), S Power & D Egan 1-1 each, J Ryan, K Franks & S Neville 0-2 each, K Breen 0-1. Scorers for St Louis Grammar School: R Graham 2-0, J McNaughton 0-6 (5f), S Elliot 0-3, C Doherty-Cunning 0-2, E O’Neill & K Molloy 0-1 each. ABBEY CBS: A Griffin; C Ryan, D Byron, C Bradshaw; S O’Brien, J Ryan, C Donovan; K Breen, T Lowry; S Neville, S Power, R Doody; K Franks, D Egan, N Heffernan. Subs: C Hennessey for Donovan (49), C Maher for Egan (55), M McCormack for C Maher (70), Egan for Franks (77). Subs: S McKinley for Graffin (49), N Shannon for McGarry (69), E Fyfe for O’Neill (77). 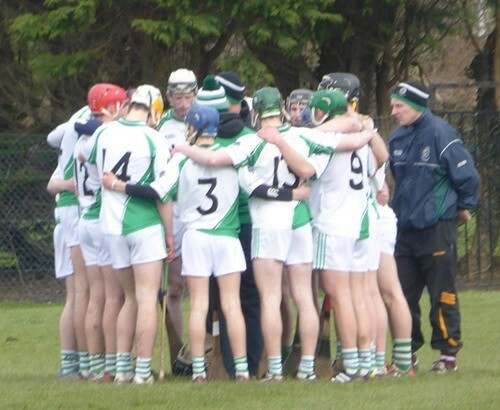 Following their narrow escape in the All Ireland semi-final against Johnstown the Abbey CBS is gearing up for a showdown with St. Louis Grammar School, Ballymena, in the final of the post-primary schools’ senior hurling ‘B’ championship, the Paddy Buggy Cup, at Semple Stadium on Easter Monday next. It’s been a long and testing campaign for the Abbey boys who’ve come through some difficult ties en route to this final. Their semi-final clash with Colaiste Mhuire, Johnstown, was the most difficult of the lot where they had to rely on a commanding first half lead to withstand a spirited second half recovery by the Kilkenny school. However, surviving in tight games wasn’t new to the Abbey lads. In their Munster semi-final clash with Glanmire Community College the game went to extra time before the Abbey came through. With a number of the Abbey players having tasted defeat in last year’s All Ireland schools’ football equivalent they’re battle hardened and that resilience has stood to them in this campaign. It’s a resilience that they’ll need against a St. Louis Grammar School which brings a big reputation on the long trek south from Antrim. The Ulster champions were hugely impressive in their All Ireland semi-final win over St. Raphael’s of Loughrea. Having led by just five points at half time the St. Louis team really turned the screw in the third quarter and at one stage led by fourteen points before the Galway side salvaged some consolation scores near the end to eventually lose by eight points. For the Abbey this final will see the return to action of centre back, Josh Ryan (Doon), who missed the semi-final through suspension. His return should further strengthen a rearguard that hasn’t conceded a goal in its last four games. It was that miserly defensive record, aided majorly by the excellent goalkeeping of Aidan Griffin, which saw the Abbey through against Johnstown in the semi-final. At midfield Kieran Breen and Tommy Lowry have been key components of the team all year while in attack Shane Neville, despite a quiet day in the semi-final, is top scorer. Shane Power, Rian Doody and Daire Egan also contribute handsomely to the effort while Niall Heffernan is likely to return to the forwards this time after filling the gap left by Josh Ryan in defence in the semi-final. St. Louis has never won this title – their Ulster win this year bridged a 27 year gap – while the Abbey is chasing its third in the grade following wins in 1992 and 2002. Significantly though the previous wins were achieved before the revamping of the competition to include vocational schools in recent years. There’s an interesting historical connection between these schools. They previously met in an All Ireland football final. It was back in 1998 when the Abbey pulled off a famous win over the Ballymena school in the All Ireland senior football ‘B’ final played at Croke Park. The team was captained by Aherlow’s Peter Leonard and one of the star players was Damian O’Brien who scored 0-7 in a 1-13 to 0-10 win. Damian subsequently went on to play senior football for Tipperary and is currently a PE teacher at the Abbey. The Abbey therefore chases a double over St. Louis on Monday afternoon next. The team is managed by Kieran Hickey (Garryspillane), assisted by Jim Ryan (Emly) and Darragh O’Donovan (Doon), Limerick U21 All Ireland medalist in 2015 and currently a member of the county senior panel. The ‘B’ final will be followed by a hugely anticipated ‘A’ decider between Ardscoil Ris of Limerick and St. Kieran’s of Kilkenny. Abbey CBS 0-19 Colaiste Spioraid Naomh, Cork, 2-9. Abbey CBS 3-21 Borrisokane CC 0-17. Abbey CBS 2-17 Patrician Academy Mallow 2-6. Abbey CBS 2-8 St. Joseph’s Tulla, Co. Clare 0-8 (Munster quarter-final). Abbey CBS 2-11 Glanmire CC 0-14 AET (Munster semi-final). Abbey CBS 3-15 Mitchelstown CBS 0-11 (Munster final Tom Collum Cup). Abbey CBS 2-7 Colaiste Mhuire Johnstown 0-12 (All Ireland semi-final). This entry was posted on Monday, March 28th, 2016 at 12:00 am and is filed under events, News. You can follow any responses to this entry through the RSS 2.0 feed. Both comments and pings are currently closed. Kerry defeated Monaghan by 1-17 to 1-9 in the Allianz Football League Division 1 on Sunday March 27th at Clones. The Kerry Senior Football Team to play Monaghan in Round 6 of the Allianz Football League in St Tiernach’s Park in Clones on Sunday (3:00pm) shows 2 changes in personnel from the side that defeated Mayo in Round 5. Brian Kelly starts in goal in place of Brendan Kealy as Eamonn Fitzmaurice continues to rotate his goalkeepers and David Moran, injured subsequent to the Round 2 game against Roscommon, resumes after injury in place of injured Captain, Bryan Sheehan. The list of substitutes is notable for the return from long term injury of Paul Geaney who joins the match day squad for the first time since the All Ireland Final against Dublin last year, and Killian Young who also returns from injury returns for his first game since the Round 2 game against Roscommon. Alan Fitzgerald returns after suspension. Monaghan (Allianz FL v Kerry): R Beggan; C Walshe, D Wylie, R Wylie; D Mone, F Kelly, K O’Connell; N McAdam, D Hughes; S Carey, D Malone, T Kerr; R McAnespie, D McKenna, C McManus. This entry was posted on Sunday, March 27th, 2016 at 4:00 pm and is filed under events, News. You can follow any responses to this entry through the RSS 2.0 feed. Both comments and pings are currently closed. Clare defeated Longford by 1-20 to 1-9 in the Allianz Football League Division 3 on Sunday March 27th at Cusack Park Ennis. Cork defeated Down by 0-12 to 0-7 in the Allianz Football League Division 1 on Sunday March 27th at Pairc Ui Rinn. Cork (NFL v Down): R Price; C O’Driscoll, E Cadogan, K Crowley; T Clancy (Fermoy), J O’Sullivan, B O’Driscoll; K O’Driscoll, I Maguire; S Kiely, P Kerrigan, M Collins; C O’Neill, P Kelleher, L Connolly. London defeated Waterford by 0-13 to 0-12 in the Allianz Football League Division 4 on Sunday March 27th at Fraher Field Dungarvan. This entry was posted on Sunday, March 27th, 2016 at 3:00 pm and is filed under events, News. You can follow any responses to this entry through the RSS 2.0 feed. Both comments and pings are currently closed. Sligo defeated Limerick by 3-10 to 1-12 in the Allianz Football League Division 3 on Sunday March 27th at Markievicz Park. This entry was posted on Sunday, March 27th, 2016 at 12:00 am and is filed under events, News. You can follow any responses to this entry through the RSS 2.0 feed. Both comments and pings are currently closed. Mitchelstown CBS defeated St Marks Warrenpoint by 0-11 to 1-7 in the Masita GAA All Ireland Post Primary Schools Dr Eamonn O Sullivan (SF “C”) Final on Saturday March 26th at Newbridge. All-Ireland Post-Primary SFC ‘C’ final – CBS Mitchelstown 0-11 St Mark’s, Warrenpoint 1-7: CBS Mitchelstown added another chapter to their illustrious history by adding their first All-Ireland title at St Conleth’s Park, Newbridge on Saturday. The Cork school, who joined the Corn Uí Mhuirí (Munster senior A) roll of honour as far back as the 1975-76 season, have been regulars in the winner’s circle in both codes in subsequent years at domestic and provincial level. They had never scaled the highest peak until claiming the Masita All-Ireland post-primary schools’ senior C football title however. They had to hold off a fierce late rally from a gutsy St Mark’s unit that just fell short, although Tiernan Rushe’s goal deep in injury-time was the final act of the game. That score could not mask the merit of Mitchelstown’s victory, as they dominated for the majority of proceedings and, while their Warrenpoint opponents undoubtedly upped the tempo in a frantic bid to rescue themselves, the winners certainly invited them on as they increasingly adopted a policy of containment. Cathal O’Mahony was the chief contributor for the North Cork crew, scoring five points, including four from play, while 16-year-old Mark Keane was also massively influential at full-forward and as a ball-winner in the middle as the they stormed into a seven-point lead approaching the end of the third quarter. The margin would have been greater had O’Sullivan not leaned back on his 15th-minute penalty kick and seen the ball rise just over the Warrenpoint crossbar. Brian White had taken a wonderful pass from Sean O’Sullivan earlier on to finish well, while Keane kicked a tremendous solo point. Eoin O’Mahony slotted two frees to go with the unrelated Cathal’s three from play, the third coming just moments after Cathal O’Sullivan had made a brilliant intervention to deny St Mark’s a goal. The Down men went in trailing by 0-8 to 0-2 at the interval, with only a brace of points from Rush to show for their efforts. They had been playing into the wind though so would not have been without hope at the break. Nevertheless, despite scores from Aaron Magee and Ciaran Tinnelly, the margin had increased by one as White and O’Mahony (two) found the target for Mitchelstown. St Mark’s threw everything at them in the closing period, scoring three points in succession through Tinnelly, John McKernan and Rushe, to reduce the margin to four but Rushe’s goal came too late to deny Mitchelstown. This entry was posted on Saturday, March 26th, 2016 at 12:00 am and is filed under events, News. You can follow any responses to this entry through the RSS 2.0 feed. Both comments and pings are currently closed. Kerry defeated Cork by 0-20 to 1-12 in Round 7 of the Allianz Football League Division 1 on Sunday April 3rd at Austin Stack Park Tralee. The Cork Senior Football team for Sunday Allianz Football league game v Kerry in Austin Stack Park Tralee @ 2pm has been announced as follows. The Kerry Senior Football Team to play Cork in Round 7 of the Allianz Football League in Austin Stack Park Tralee on Sunday (2:00pm) shows 4 changes in personnel from the side that defeated Monaghan in Round 6. Brendan Kealy starts in goal in place of Brian Kelly as Eamonn Fitzmaurice continues to rotate his goalkeepers, Killian Young starts his first game since the Round 2 game with Roscommon having recovered from injury and is picked at centre back instead of Aidan O’Mahony while Padraig O’Connor, who started in Round 3 against Down, comes in at half back in place of Fionn Fitzgerald. Up front, Alan Fitzgerald starts in place of Darran O’Sullivan who, along with Aidan O’Mahony, picked up knocks in the Monaghan game and were not considered for Sunday’s match day panel. The list of substitutes is notable for the inclusion of Michael Geaney and also Tommy Walsh who returns to the match day panel having received a late injury against Down in Round 3. This entry was posted on Monday, March 21st, 2016 at 7:01 pm and is filed under events, News. You can follow any responses to this entry through the RSS 2.0 feed. Both comments and pings are currently closed.